Mortgage down payment is the amount of money paid upfront by the home buyer to obtain a mortgage for purchasing a home. In other words, it is the amount paid towards the price of your home at the time of your purchase and rest of the amount is covered by your mortgage financing. 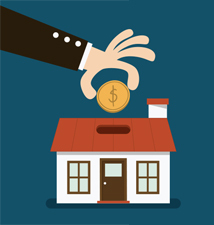 Your down payment is one of the crucial factors that significantly affect maximum affordability. The more you are able to provide as down payment, the lesser will be the size of your monthly mortgage payments. As your down payment increases, your mortgage default insurance premium is reduced and vice versa. Mortgages are typically classified as conventional or high ratio mortgages. Whether you will get a conventional mortgage or a high-ratio mortgage, it is determined by the amount of your down payment. When down payment is at least 20% of the purchase price or more, it is regarded as conventional mortgage. On the other hand, if the down payment is less than 20% of purchase price, it is regarded as high ratio mortgage, which must be insured. It is important to note that a high ratio mortgage must be insured by a mortgage insurer such as Canada Mortgage and Housing Corporation (CMHC), Genworth Financial Canada or Canada Guaranty. Banks finance property only up to 80% LTV. Home buyer is required to pay the premium for the insurance. Such kind of mortgage default insurance protects the lender in case the borrower defaults on the mortgage. The insurance premium depends upon the amount borrowed and down payment and generally varies between 0.5% and 2.75% of the mortgage amount. One can pay the premium at the time of purchase of the property or else it will be added to the principal amount of the mortgage. Such insurance premium may subject to provincial sales tax, which cannot be added to mortgage amount. For properties between $500,000 and $1 million, those who are getting an insured mortgage will now need to 5% down on the first $500,000, and 10% down will be required in the next $500,000. The new rule doesn’t affect properties over $1 million as they do not qualify for high-ratio mortgage insurance anyway.